and went to the IMMA shelter to sew with 9 girls. At the St.Patrick's Day parade we had already talked about sewing pillows - so that's what we did! 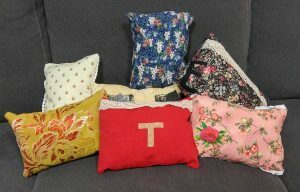 The nice thing about pillows is that they are really easy to sew! As simple as sewing two squares of fabric together, or you can decorate them. Here are the results. Remember if you are interested in a sewing project you can contact Claudia to book a lesson.